If you have natural gas in your home, at one point or another, you will need the services of a company that offers gas line testing. If you think your lines may not be as strong as they used to be or if you’ve smelled a gas odor in or around your home, it is important to contact a certified plumber right away. No matter how big or small, a gas leak is an emergency. As a homeowner, it’s important to make yourself aware of the condition of your exterior and interior gas lines. 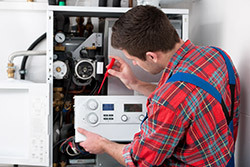 All elements of your gas plumbing system need to be properly maintained to ensure the integrity of the system, prevent failure and avoid gas leaks. A small leak may not seem like a major problem, but as gas builds up in a confined space, it becomes extremely volatile and can explode or cause illness in your family members. If you have any reason to suspect that there may be a gas leak on your property, it’s crucial to have the line tested right away. If you suspect a gas leak inside or outside your home, your first step should be calling a licensed and certified plumber in Rochester NY . Never try to determine the location of the leak yourself. Turn off the gas main, and do not turn any electrical devices on or off. When possible, it is best to vacate the premises until help arrives. Natural gas fumes are unstable and in addition to potential disasters like explosions, they are not safe to breathe. The best way to prevent problems with your gas lines is by properly maintaining them. At GT Campbell Plumbing, we recommend routine gas line testing once or twice a year. We will come to your home and test all of the gas lines inside and outside your home, and we will repair and replace lines as needed. If you need gas line testing in Rochester or the surrounding areas, don’t hesitate to call the expert technicians at GT Campbell Plumbing.